In 1990, Alex and a group of artists and art professionals embarked on a lawsuit to protect art exchange with Cuba against the U.S. embargo using the First Amendment in the Bill of Rights. After our government granted a consent decree making it legal for art dealers to travel to Cuba to purchase art, Ales and I received an invitation to attend the 3rd Havana Biennial. We had the opportunity to become familiar with Cuban culture and meet artists and art professionals. Inspired by our experience, Alex and I felt a need to do what we could to bring American art to Cuba and Cuban art to the U.S. We participated in conferences, arranged seminars, organized exhibitions and shared our expertise. We opened our home to Cuban artists who visited the U.S. and shared our contacts. About the same time, Peter and Irene Ludwig became interested in Cuban contemporary art after seeing an exhibition in Dusseldorf, Cuba SÃ­. 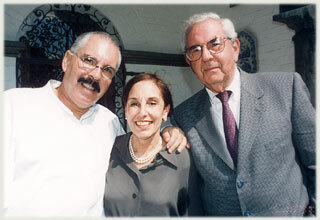 They made many visits to Cuba and with Helmo HernÃ¡ndez, as their advisor, formed an exceptional collection of Cuban art. Peter Ludwig wanted to develop a Ludwig Museum in Havana. However, due to the conditions during the Special Period, it was impossible to create a Ludwig Museum in Havana and it was decided that a foundation with a mission to protect and promote Cuban artists in Cuba and abroad would help prevent artists leaving the country. Many of the artists graduating from the art schools at that time were exceptional. Today they rank as some of Cuba’s most important artists. In 1995, The Ludwig Foundation of Cuba (LFC) was created as an autonomous, non-governmental, not-for-profit, public entity for the protection, preservation and promotion of the work of Cuban contemporary artists within Cuba and abroad. Helmo Hernandez was appointed as LFC’s President, and it was a privilege to be asked to serve on their Honorary Committee. The Ludwig’s commitment and cooperation enabled the new foundation to respond to the huge economic difficulties on the island, which had previously resulted in the emigration of artists and a weakening of cultural institutions. The Ludwig Foundation of Cuba addressed this situation and continues to maintain an important dialogue between artistic expression and society. Its exhibitions and cultural exchanges have enabled Cuban artists to engage in important dialogues with their international colleagues. We were encouraged to formalize and expand our efforts when we realized the interest Americans had in Cuban art and culture through the programs taking place at the Ludwig Foundation of Cuba. In May 2000, The American Friends of the Ludwig Foundation of Cuba (AFLFC) was established as a 501 (c) (3) tax-exempt organization chartered in the State of New York. Very quickly, Cuban artists, curators, theater directors, dancers, musicians, filmmakers and other professionals working in art related fields began traveling to the U.S. to participate in our programs, courses, conferences, lecture series, performances and festivals. These experiences have proved to be rewarding for the Cubans as well as their American counterparts. When travel restrictions curtail some of our programs, we make adjustments to meet these requirements and continue to serve the art communities in both countries. Study abroad programs with courses at LFC are flourishing and offer an enriching experience.